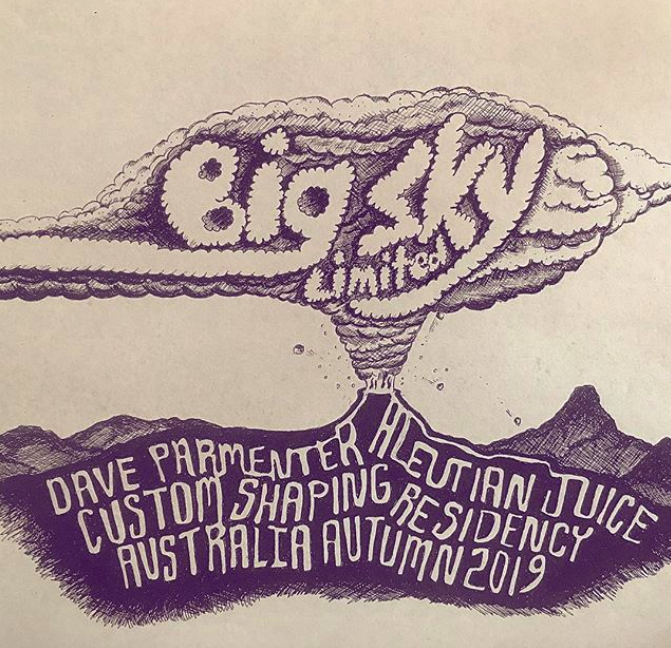 This autumn, Dave Parmenter will be keeping a residency at Andrew Kidman's shaping bay. If you want one of Parmenter's shapes then follow Big Sky Limited or Kidman on Instagram for further details. I'll also post details here. There'll only be 20 orders taken. Free shirt with every board! Wonder if he is open to trading for jewfish fillets? My New Year resolution this year is to purchase a classic board or two from shapers I admire. A Mackie sidecut fish, Kidman 'Dream' board, Corey Graham twin fin, Gary McNeil Torus channel, Greg Brown Thruster etc etc. Obviously that's more than two so I expect this resolution to carry on for a few years. Why change it? Really interested on the cost, he is here from Feb 20 so that's pretty soon. Yeah a widowmaker with alkali fins. Re cost, I was in touch with Kirk Gee in LA (@foamandfunction) a few years ago to enquire about ordering board. He said that Dave's prices were very, very reasonable. And Dave was really nice and switched on to email with, btw. Who will be doing the glassing in NSW? I like your idea, Stu. I have long had a rule to only order boards from shapers I like and admire. Won't have boards from idiots. Pretty sure Kidman uses Peter Mo at Modek, Currumbin, so they'll probbaly get done there. To be confirmed though. On the subject of Dave P. He's a damn impressive shaper but he's more impressive as an individual in thought & action. You won't ever see Dave wearing 'surf gear', you will though see him dressed well. More than likely in plain RM's. On another note don't ever try and challenge him to a shoot out on Australian history, he'll nail you every time. If you're at a Pub Quiz Night and see Dave quietly at a table - aim for that one. You'll pick up the meat tray for sure. I remember him dressed in Game Hunting Chic - crisp shirt tucked into khaki strides, trim moustache and a sharp part in his hair - for a White Horses shaper story. Knockout get up. Serious, ha! That's Dave to a 'T'. I'll have to look that article up. His “ Everybody surfs “ thing was pretty cool. About the only readable thing in those Seppo mags at times. There was also an essay in Surfer that I really enjoyed. The specifics have been lost to time but the gist of it was a portrayal of the surfer as a frontiersman, basic in needs, noble in his quest to sate them. It was classic mythologising, could only have been written by an American, and if it sounds ham-fisted then blame my description of it. The surfing world could do with more lone wolf angst and less 'life is better when you surf'. Was that when he visited Wayne Lynch in Vicco and went out on his catamaran ? Angst doesn't sell Stu. This time of year in Sydney is a demonstration of just how strong the "life is better when you surf" message has been. Hordes of beginners and anyone who has ever tried it dragging the old stick out from under the house. Mass marketing destroys identity. You only get to sell your soul once. Classic boards by admirable shapers? Worthy of it's own thread. Wonder if my wife would like a new Aleutian Juice. How’s that work , Freeride ? You ever get to borrow the keys to your missus’ boards ? Just checked out the DP site. Very Nice. $600US for a standard stick up to 6’8”. Fair enough. I dig his shaping tutorial. Long and complicated story Blowin. The gist of it is a couple of days before we were due to go on a little surfing safari I took my wife's board out at 6ft Lennox Point and snapped it in two. it's a kind of payback. Sort of a win win FR,she gets a new board that you can ride. An outline I've seen Dave do before which I'd describe as a hybrid stretched Hawaiian shortboard/mid-length. Angular, steep Hawaiian rails in the Brewer/Parrish mold. Wide-point just forwards. Narrow square tail. For my beloved an easy turning, uncomplicated "short-board" for her that she can paddle in with a ton of glide into winter peelers at the local Points. For me, a board that will gobble up a certain type of windy, current-y point surf where you need to paddle fast from A to B, be able to hunt down the apex of the peak in wide ranging take-off areas and then get going and build speed on speed on long ranging walls that can do anything from barrel to peel perfectly to throw big long sections. Could also double as a true mid-length for a splash around in baby food on a nice winter V-bank during winter westerlies. Have you ridden one of those widow makers before ? The outline looks nice , I’m just curious about the fin set up . Have you any experience with the large rear fin plus the two little stabilisers ? Each to their own , of course, but I’ve found that the opposite fin set up is far superior for my own liking in those particular waves. That of the extra broad based side fins with a smaller rear fin . Seems to provide plenty of drive and carve whilst staying free off the top. To be honest ....I’ve never ridden a single in decent waves. Looks like they’d be great for projection but gammy in tight turns in steeper sections? His Widow makers do look beautiful aside from that. I've never ridden a parmenter widow maker....but I've ridden heaps of 2+1 set-ups and bonzers. Single fins with benefits is how I describe them. When the centre based fin is the dominant force, you get that single fin, high-line, drag free feeling. When the side fins are large and dominant, you lose the high line glide and get more traction/rotation through the turn. You can turn tighter and harder in critical sections. Thats my experience. Letting a single fin/bonzer/2+1 really let go and glide high line into high line on a stretched out Pointbreak wall is one of surfing's finest feelings imo. It feels like flying to me. You had me at high line. Life’s too short .....there’s too many boards and waves out there for a single lifetime. I look at that red widow maker and can fully visualise trucking through the guts of a pit on it. Love Parmenter’s boards, very jealous. Ahhh the memories, my NPJ Widowmaker on surprisingly uncrowded, lined up Snapper/LM.... what a delight. 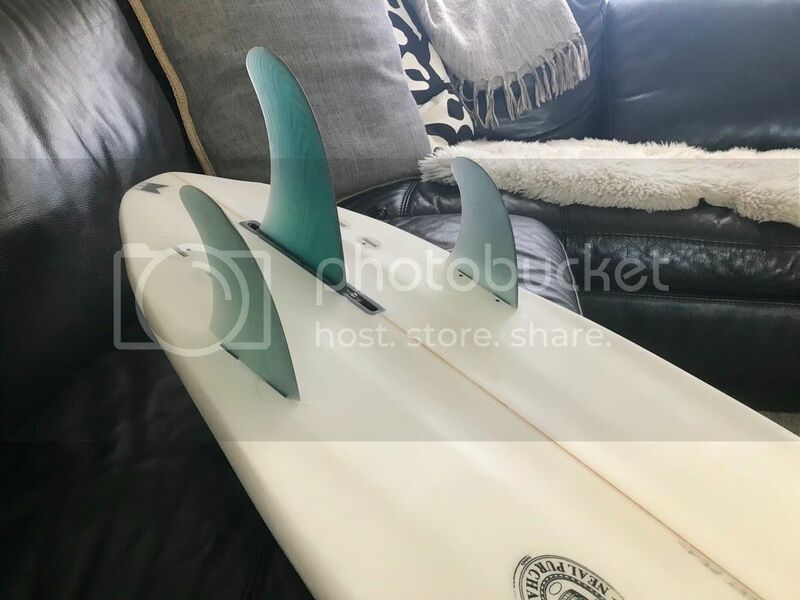 Often thought about getting a 2+1 made for quality hollow Indo like waves. Yeah true, but then it gets confusing about what setup you should ride on the day! Radically different sized side bites there Markxxx, love the bottom contours. Looks fast just sitting there. Yeh, NPJ says he uses bigger sides/smaller centre. Yeah it looks like a lot of fin but as Neal says it makes it super user friendly in more average conditions. BTW that’s not actually Neal’s go to Widowmaker set up, he runs a shorter centre with a little more base. Find what you like and stick to it. Yeah, but don't afraid to break out of habit/comfort zone. I've learnt so much in the last 2 years riding boards I would never have considered "what I like". Habit, is mostly what constrains skill set as you get older. You do what you always do and get what you've always gotten. eg, I found, pretty much by mistake, that the best small wave groveller board I've ever ridden is a stumpy, asymmetrical epoxy fish. This thing just eats up slop. 5 years ago, 3 years ago, I would have sneered at it. But conversely don't confuse yourself. I had an embarrassment of riches in December with four new boards: two ordered months and months earlier and got delivered the same day, one I made, and another was a long delayed birthday present. Tied myself in knots trying to figure them all out, even mucking around with various fins to match, so I ended up back on old faithful - which coincidentally is also asymmetrical. one at a time's good fishing, thats what my old Grandad always said to me. Yeah each to their own. I know guys who don’t deviate from “their dims” no matter what the waves, won’t ride a groveler incase it messes with their surfing. Personally, the most fun I’ve had surfing in the past 20+ years is the last few years when I put the HPSB away and stopped taking surfing so seriously. That Widowmaker sounds superb, SS. Let us know how your wife goes on it, and post a photo of the board, ay! Re mixing ut up, we had three days of big, thumping onshore beach break recently. I Surfed my 6'3 Ghost, 6'6 Bourton Reef Swallow, and 6'10 Webster DS. Loved them all, and loved how different they rode. Jed makes some great boards. He tries his hand at everything, some of which doesn't appeal to me, but he hits the mark with classic shapes like that. dunno about the colours though. yuck. Did a fair bit of tyre kicking in his shop in November last, just narrowly escaped without a purchase.